History of the Island | Pan Rhodian Society of America "Apollon", Inc. According to this myth, after Zeus’s victory against the Giants, he decided to divide the earth among the Olympian gods; The only god who received nothing was Helios. He, according the myth, was absent and “No one remembered to include him in the draw”! When he came back he demanded his share, but Zeus told him that he was not able to make the cast again because the rest of the gods would not agree. Helios was disappointed but asked Zeus and the other gods to promise that the land that was to rise out of the sea could be his. Another name for Rhodes was Telchina, because its first inhabitants were said to be the Telchines , gifted metal workers who lived on the island in the Prehistoric Age. The first known ‘human’ inhabitants were the Carians, a tribe, which came from Asia Minor. The Phoenicians, great merchants who made Rhodes an important commercial center, followed them. Their leader Cadmus, who introduced the first alphabet, founded the first Phoenician colony on Rhodes Island. In the recorded history of the Eastern Mediterranean, Minoans from Crete settled on Rhodes. During the Peloponnesian War (431-404 BC), the Rhodians decided to found a new city by uniting the three largest cities on the island. They were very aware of the meaning of the motto “power in unity”. The new city was called Rhodes, after the island itself. Its foundation in 408 BC constitutes a landmark in the history of the island. When Alexander’s empire fell to pieces, Rhodes developed close trade and political relations with the Ptolemeus Dynasty of Egypt. This was a ‘casus belli’ for Antigonus, the King of Syria, who in the summer of 305 BC sent his son, the famous Demetrius Poliorkitis (the ‘Besieger’) to capture the town of Rhodes. Demetrius’s failure to conquer the island marked the beginning of a new era for Rhodes, during which trade and marine activities reached their peak. The Rhodians, in their effort to show correct maritime conduct, put into effect the so-called ‘International Marine Law of the Rhodians’, a code of law which is one of the most important early legal documents in the world. The Byzantine emperors captured their capital back from the Crusaders in 1261, and Rhodes theoretically returned to their control. In fact, the island was under the Genoese admirals whose fleet remained in its harbor. In 1306, one of those admirals, Vignolo Vignoli, sold Rhodes, Kos and Leros to the Knights of St John in Jerusalem, who by force had gained full control of the island by 1309. 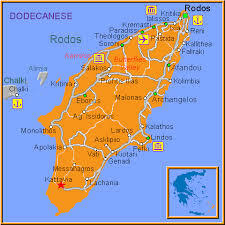 Caviar, textiles of wool and silk, oil, wine, sugar and perfumes, saffron, wax, pepper – Rhodes was the paradise for merchants! Wheat was brought to Rhodes from Cyprus, Asia Minor and, later, Sicily; wine was brought from Crete and Italy. Disputes among merchants were settled in the Mercantile Court of Rhodes, and three galleys protected the sea-lanes on which the island lay. While the Knights ruled Rhodes, large Florentine commercial and banking houses established branches on Rhodes Island. This was a proof of the island’s power. The Knights remained in Rhodes for 213 years until 1522, when, on December 29th, the last of the Grand Masters, Villiers de l’Isle Adam, surrendered the island to Suleiman the Magnificent. The Greek inhabitants of the city were forced to leave the walled Town and settle outside it, forming new suburbs which they called ‘marasia’. The Turks never managed to attain complete dominance over the island, and the Turkish part of population was always a small minority. During those dark days of foreign occupation, many towns – and especially Lindos – were able to flourish thanks to their stock and production in foodstuffs, clothing, silverware, household utensils and perfumes. After the defeat of the Axis powers, Rhodes and the other Dodecanese islands came under British military administration until March 7th 1948, when the Greek flag was finally raised over the Governor’s Palace.